In today’s world there are many different reasons to want to return to school whether it be to further your career, sharpen your skills, or meet the minimum requirements for a teaching position. But if you are a successful working illustrator, you may not think that you have time to earn your graduate degree without interrupting your income, and falling further from your goals. You may have a family to support, and taking time off from work just isn’t an option right now. If this sounds like you then a Low-Residency Program may be the solution. In this Low-Residency program, you are considered a full time student, so you are eligible for student loans, but you only attend classes for four weeks out of the year. Four weeks away from home out of fifty-two weeks in the year, and you can earn that MFA degree in two years and two weeks! There aren’t many options out there when it comes to Low-Residency. 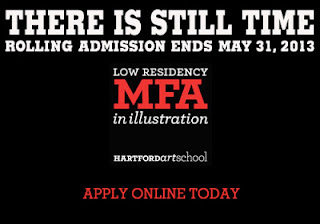 In fact, the University of Hartford offers the only Low Residency Master of Fine Arts program in the country dedicated specifically to illustration. 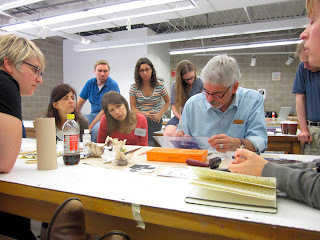 The cornerstones of the program are the three intensive two-week summer residencies in consecutive Julys at the University of Hartford’s campus in Hartford, CT. 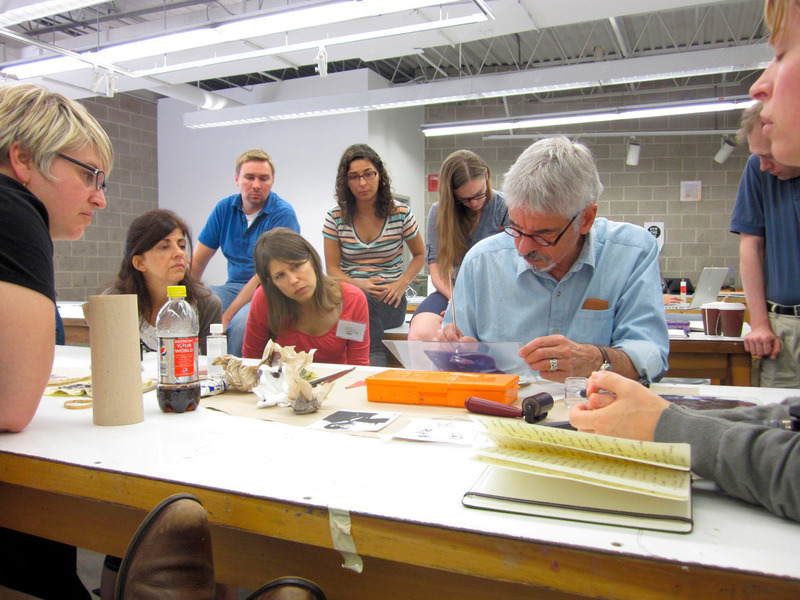 Between these two-week studio and lecture-packed residencies, students meet one week each November and one week each March in various cities across the United States with the leading illustrators and illustration entrepreneurs in that area. Graduation from the program is always held at the end of the third two-week summer residency at the University of Hartford. Students enrolled in the program are given assignments to work on throughout the year, but only have to be away from work and family for four weeks out of the year and can devote their time to their careers. 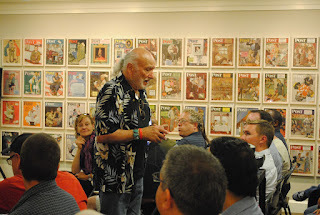 The program was conceived and is directed by internationally renowned illustrator, educator and illustration historian, Murray Tinkelman. Murray has over 50 years of teaching experience including over 35 years experience in organizing and leading successful low residency graduate programs. Murray was also awarded the prestigious Distinguished Educator in the Arts award in 1999 by the Society of Illustrators. 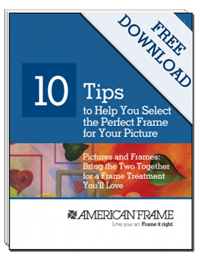 As you can see, great art deserves great frames! The program is fully accredited by NASAD and NEASC. There are still openings in the next incoming class and the rolling admissions deadline for a July 2013 start is May 31st, 2013. You can find more information about this program on the website: http://hartfordillustrationmfa.org, or the blog (Squint) http://hartfordillustration.com/. You can also connect with students through Facebook, LinkedIn, or Twitter where my blog is being featured as we speak! 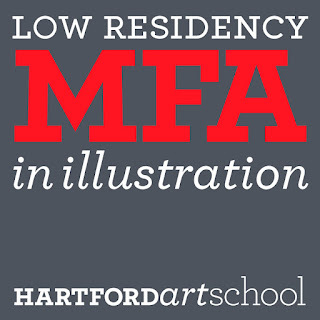 This program is the ONLY Low Residency MFA dedicated exclusively to illustration. 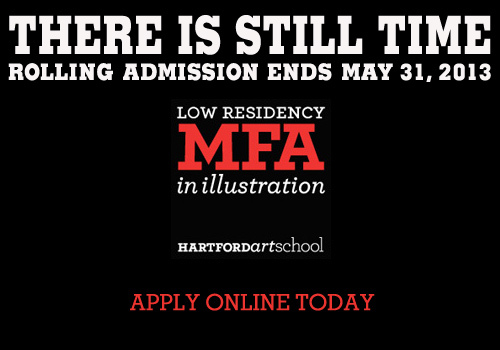 The low residency format provides professional illustrators and designers an attractive and accessible opportunity to work with the country's top illustrators and illustration educators while refining their skills and techniques, expanding their creative intellect, shaping their illustration career into a business, while pursuing an MFA in Illustration. Our students all have some professional experience in the field. They are committed to the field of illustration and share their passion and professionalism with equally committed classmates. Many of them are also teaching illustration at the college and university level. Our students are typically non-traditional and range in age from approximately 25 to 55. Both students and faculty come from all over the country to our July contact periods in Hartford. • This program accepts 20 students by rolling admissions each year with classes starting in July. • All students are considered full-time for the duration of the program and are eligible for student loans. • All studio classes are team taught, making the student/faculty ratio very conducive to learning. • The thesis is a body of illustrations that students plan to sell. • Our thesis advisors are professional illustrators and attend each contact period, as well as always remaining accessible by email and phone. 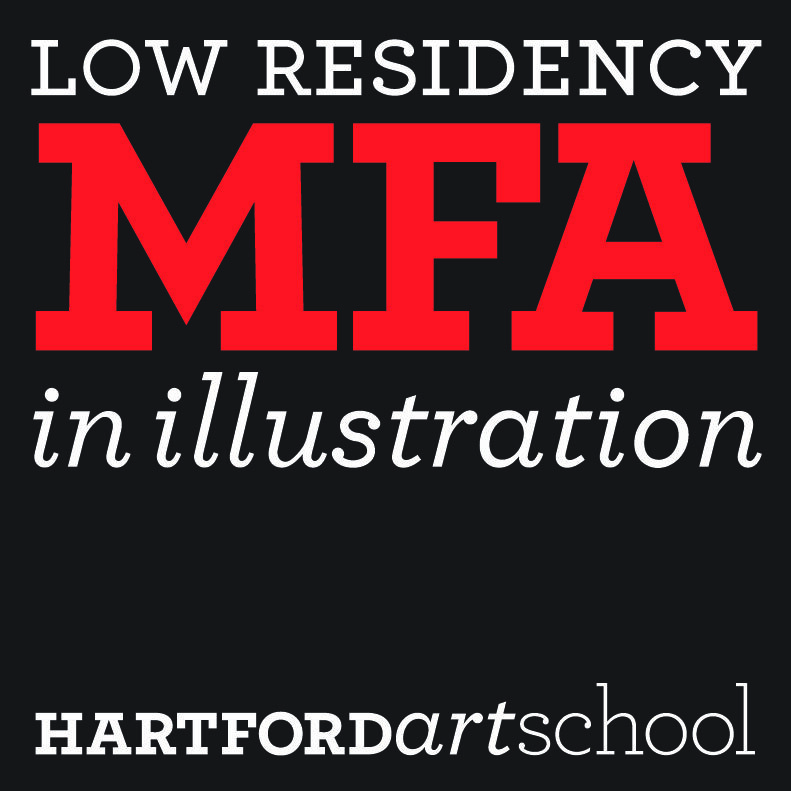 Three intensive 2-week July residencies at the Hartford Art School, University of Hartford. Our faculty comes to Hartford from across the country to teach each July. Four 1-week contact periods (1 week each November and 1 week each March) at selected cities nationally where substantial numbers of high profile illustrators work and reside: New York NY, Pasadena/LA CA, San Francisco CA, and Fort Worth/Dallas, TX. Each of these professional illustrators, art directors, and illustration representatives present their work to our students and conclude with an open discussion relative to their work and the illustration profession at large. Students share in the expertise of these professionals and gain insight into the similarities and differences illustrators face in different markets and regions across the country. Every prospective student completes an extensive phone interview with Murray and Carol Tinkelman so that the student can decide whether the program is a good fit for them. During the interview process, we communicate our mission, vision and values to the prospective student while educating them on how they can successfully complete a low residency MFA while still attending to their illustration and design businesses, their teaching commitments and their families. Prospective students then send a website address or a CD with at least 10 images of their work to Murray Tinkelman for review. Upon acceptance of your portfolio the registration process begins. The Hartford Art School is accredited by NASAD. The University of Hartford is accredited by NEASC. Shauna Leva is an alumnus of the Hartford Art School now emplyed by the MFA in Illustration Program as head of advertising and social media management. She works under the program administrator to try and spread the word about this small yet exciting program. She is also an illustrator herself and a fan of American Frame. These are great ideas for a designer on a budget! I will surely give this a try for my children's room – baseball and princesses will be the theme of choice. Thanks for the tips on these Cheap Wood Frames. Thanks Shauna fir introducing such a great program for students. The stanford admission essay is quite difficult to write as students find it tricky but with your program they will be able to write now. The actual stanford entrance composition is very hard to create because college students think it is difficult however together with your plan visit website these people can create right now. Excellent post, These understudies find an incredible school and school all over all over the world. Regardless, consistently they can't find extraordinary preparing. In case any individual needs to know http://www.radiologyfellowship.net/ site these incredible quality materials guideline, Thanks. Such a pretty posting over here! I saw yhour post very nicily You talk about Low Residency MFA Program.Really i appreciate the effort you made to share the knowledge. Thanks for this IT related info. http://www.personalstatementwriter.com/great-pharmcas-personal-statement-writing-service/ and it'll help you to know more about the academic papers writing. The main reason to return to school is continuing education. I choose a writing education to continue. This could be a good topics for a persuasive essay back in class.